Hermanus.co.za has always aimed to insure that its clients are given comprehensive and affordable advertising choices that will best suit their business needs. We’ve therefore come up with a variety of unique options that are upgradeable, changeable from month-to-month and offers clients prime exposure within our site, helping to grow their potential client base. All prices are subject to change, which we’ll be sure to notify you of at least 1 (one) month in advance. Unless specified otherwise, the chosen advert will only show on the designated page. Annual payments mean that you get the 12th month free! Images can include any and all information that you feel is relevant to your business – from specials to detailed shots to basic information. Please feel free to contact us for prices on our various premium advertising options. These listing-based advertising options range from Free to Extended. 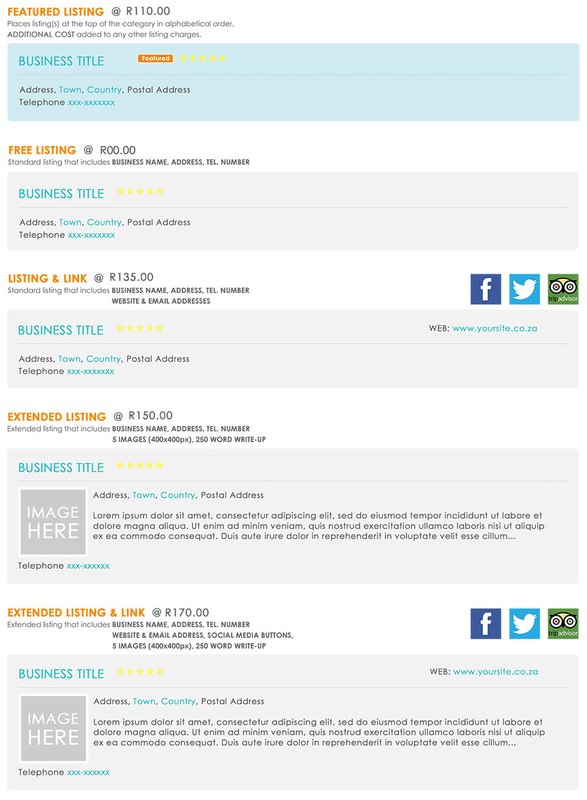 Every business is entitled to one FREE listing with Hermanus.co.za that includes the business name, phone number and physical address, which can then be upgraded to include more information, images and links (option-dependent).